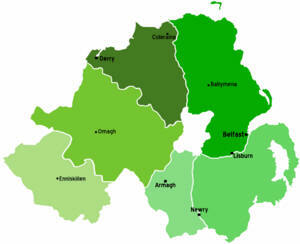 Agility in Northern Ireland is growing fast! It's a small friendly, close knit community where everybody knows everybody else but where there's still a healthy rivalry and spirit of competition - just as it should be. Over the past number of years, they have seen many changes, with many dedicated people doing their utmost to keep moving the sport forward. Although the community is small in size, there are a good number of handlers and dogs holding their own on a national level with a high standard of agility. The Glandore Gang reports on agility in the Province. 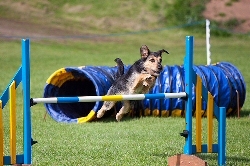 In Northern Ireland, we have an 'agility season' which runs from April through to October. Due to the fact that there are no indoor shows in the Province, we are restricted by the rather damp Northern Irish weather. During the season, there are agility shows, varying in size, at least every other weekend. The largest show we have ever had was a three ring show, but the average show has one or two rings. With the increase in competitors in recent years, however, it looks like the days of the one ring show are numbered. It is getting very difficult to fit in a full show with three runs per dog into a single ring. There are only four Kennel Club registered agility clubs running shows in Northern Ireland - Glandore Dog Training Club of Ulster, Down District DTC, Lisburn DTC and Castlereagh & District DTC. They usually putting on two, three or four shows per year each. However, most Obedience and some Breed clubs run agility at their shows, so there is no shortage of competitions for us. Unlike most shows on the Mainland, it is very common for agility shows and obedience shows to be run together. There would be a lot of competitors who compete in both sports, and this adds an extra perspective to dog sports in Northern Ireland. 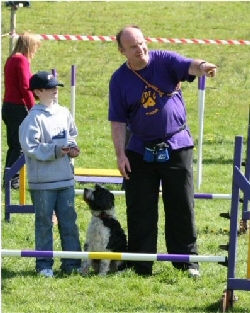 We even have competitions which are run by breed clubs, where competitors can show a breed dog, do a round of obedience and then compete in the agility ring, all within one field! There are currently two Kennel Club Championship Shows in Northern Ireland. The first is run by Lisburn DTC in June and the second by Castlereagh & District DTC in October. At local shows the norm is to have three runs per dog, and sometimes more if there are Championship, YKC or Special classes. 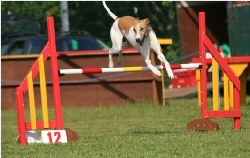 We would tend to have a much higher percentage of ABC type dogs and pet dogs competing at agility. Even in the higher grades it is a normal occurrence for ABC dogs to get placed. As for the size of our classes the average G1-7combined class for Large dogs would have 60-80 dogs, Medium 10-15 dogs and for Small 10-20 dogs. But year on year, these numbers are growing. Due to the size of Northern Ireland, most shows take no more than an hour to get to, and because of this very few venues would have facilities for overnight camping. Only two or three in the year are 2-day events. This makes it difficult for people from further a field to travel to some Northern Irish shows. Also, not many B & Bs, Inns or hotels are very welcoming of 'canine guests' in the Province. In saying all this, there are a number of competitors make the (expensive) trip over on the ferry to Northern Ireland from the Mainland during the season. More people would probably make the trip if it was better value. We think the Kennel Club could maybe negotiate special deals with one of the ferry companies. There are no restrictions on bringing dogs into Ireland. No pet passport is needed. There are various ferry operators to Northern and Southern Ireland. Flying in isn’t an option, as only one airplane company that allows dogs to be carried, and it has a minimal service. Another side effect of our community being small, is that we have to rely on a limited pool of committed, quality judges. Therefore, it is common to have the same judge a number of times in one season. Recently, a dozen new judges were approved by the Kennel Club which means much more flexibility and a well earned break for some of the existing, overworked judges. Some clubs still go to the expense of bringing in judges from the Mainland. We feel this helps to keep the sport moving forward and it is also an opportunity to get some skilled trainers from the sport to do training sessions for us locally. During the off season, there is a local All Ireland Winter League that runs for six months. It isn't a Kennel Club event, but it gets a large amount of support and nearly all Northern Irish - and some Southern Irish - handlers compete at it. There are six matches - one per month over a period of six months. It keeps us - and our dogs - limber, and usually damp and cold! Alternatively, we have the option of competing under one of the organisations in the south of Ireland. Events are run throughout the year, depending upon the governing organisation. The rules and criteria for entry may not be Kennel Club or FCI. We have only one representative on the Agility Liaison Council, Ronnie McAleese, who brings forward our opinions to the Kennel Club meetings. Members of the agility community meet up a few times throughout the year to discuss Kennel club rule changes as well as to talk about how to help agility in the country in a pro-active way. 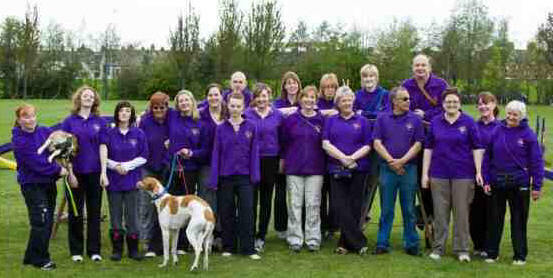 All in all, agility in Northern Ireland is a great sport and community to be part of. It is based on respect and more importantly enjoyment. Many times we have had judges from England tell us, 'It’s like agility used to be like 20 years ago in England.' We are very proud of the fact they have left with a positive view of our community. Louise Smart has been doing been doing agility for about eight years, and competing for five, She runs three dogs including Vinny, Grade 6 large brown crossbreed, 10 years old now, but in great shape. He also competes in obedience. Ferris, a huge G3 six year old white and ginger Lurcher, 6 years old is an attention seeker while Melvyn, another huge ginger G3 Lurcher (18 months) is not competing yet, but is another attention seeker. Louise loves everything about agility. Unfortunately she also loves Lurchers, so it can be a battle getting a round a course without it turning into a greyhound race. She also loves teaching agility to new handlers and finds it very rewarding. She tries to get to the KC International Festival and Dogs in Need every year as it makes for a great holiday... if you can call it a holiday. Rachel Cooper been doing agility for nine years, and competing for seven. She runs three dogs including Yeshe, a Medium G7 grey Tibetan Terrier (10 years old) and semi-retired Khizi, a Small G6 black and white Tibetan Terrier (6 years old) and wee madam Chacha, a G3 brown Spanish Water dog who is five years old and full of beanz! She has achieved what many people thought was impossible, by getting a Tibetan Terrier to Grade 7. Rachel competes in Obedience and was on the Northern Ireland team at Crufts 2010 with Chacha. She also successfully shows all the dogs. Adrian Dornford-Smith been doing agility for nine years and competing for seven. He has three dogs including Kokya, a Large G6 black and white Tibetan Terrier (9 years old), semi-retired Cockle, a Medium G3 black Tibetan terrier ( 2 1/2 years old) who is really fast and is the daughter of Khizi and Lita, a G3 blonde Spanish Water Dog (6 months old) who is not competing yet. She is the daughter of Chacha. Adrian got Kokya to Grade 6 despite being the shortest Large dog in the country. He competes in obedience and breed shows and is looking forward to trying out a Spanish Water dog at Agility when Lita is old enough! Glenn Smart been doing agility for about eight years and competing for five. 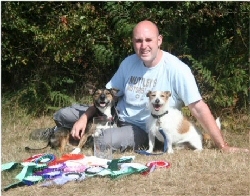 He run two dogs including Mutley, a G7 Jack Russell who is 11 years old but still in good shape for his age. He is the most accomplished / successful agility dog that Glandore has ever had. Unfortunately he's never made it to Crufts - always the bridesmaid. Glenn's other dog Leo, a G6 Kelpie type thing, is five years old and is a very nervous dog. He's been very difficult to train but is getting there slowly but surely. Glenn loves agility very much - as much as golf, if you believe that. He is very competitive and push himself and his dogs to improve all the time. However, he never forgets that agility should be fun. Glenn has learned hard lessons in the past i.e. that it does no one any favours to loose sight of the fun aspect and he believes that he is a better handler and trainer now for relaxing a little - not too much though as he still wants to get to Crufts.